Welcome to the happiest and sunniest guest room this side of the Mississippi! We named this room the ‘palm room’ for very obvious reasons and its a simple and minimal nod to the tropical vibes of New Orleans! The bones were there – those amazing pine floors, the 10” baseboards, new windows and 13’ ceilings and all it needed was some layers of style (and furniture, obviously). As you have seen here and here, this house is so incredibly open and filled with all the sunlight. It’s just the happiest place! My clients didn’t want to fill this room (or any of the rooms, really) with too much clutter and stuff, but still wanted it to feel homey and styled with the right balance of decor and textiles. They also wanted to pay tribute to New Orleans with the decor. We toyed with the idea of wallpaper, but in the end we decided on decals! Again! And what is more tropical and green than palm fronds? Did I mention the ceilings are 13 ft tall? We covered that entire accent wall from top to bottom with the decals (we chose a light green and dark green to add interesting contrast to the wall). We wanted that wall to be the star and the rest of the decor to support, not dominate so we kept things simple and minimal. To balance out all the newness in the room, we wanted to find something vintage and sourced locally so we turned to The Green Project in New Orleans. They carry all sorts of old things like windows, doors, cabinets. light fixtures and furniture among many other items. We found that amazing vintage door and my client had the brilliant idea to turn it into a headboard for the king size bed! Genius! I love adding in unexpected pieces of vintage decor. We kept the linens crisp and simple with mainly white bedding and added some coordinating color and pattern in with throw pillows. 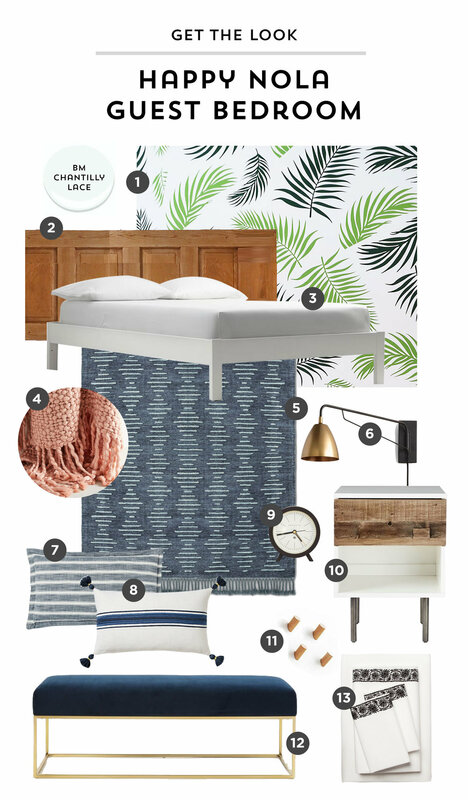 I love using strips especially when paired with a more busy pattern (like the palm fronds on the wall). They add a good amount of contrast and balance things out in the room. We also found that pink chunky throw which gave the bed a dose of cozy texture. Since this is technically a guest room, we wanted to add some storage to the room. Personally, I’m a big fan of hooks when I stay at a hotel or AirBnB and these simple wooden ones were perfect for sweaters, hats and bags. We also added that blue velvet bench as a place to sit and tie or your shoes or store your larger bags. Having spent hours installing those decals, it is so rewarding sitting back and looking at the finished space! And what a fun guest room to sleep in! I can’t want to get back down to Nola! What do you guys think? Have I convinced you to get on the decal train yet?